The first time I saw a black sand beach was in Hawaii and I’ll never forget how stunning it was. I couldn’t hardly take my eyes off of it. The black sand in contrast with the blue water and bright green shrubs is an incredible sight. 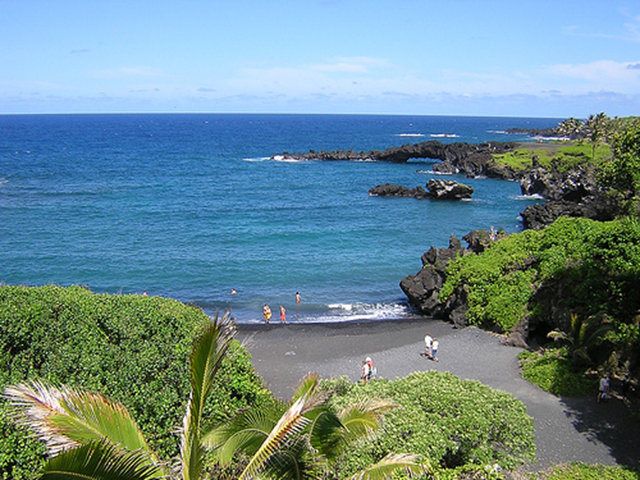 Black sand beaches are fairly rare, but relatively easy to find on the Maui and the Big Island. The black sand was created many years ago as the chunky type of lava (a’a lava) shattered into tiny pieces as it met the ocean. The photo above is of Waianapanapa Black Sand Beach on Maui. You can find this gorgeous gem at the Wainapanapa State Park along the Road to Hana. This beach is actually a little bit more pebbly, which creates an entrancing sound as the waves lap onto shore and then flow back. This park also has a beautiful lava sea arch and sea caves. You will find great park facilities here for restroom breaks, showers, and picnic tables. 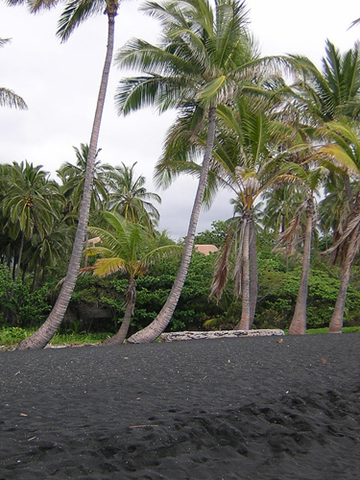 The Big Island has several black sand beaches. The photo on the left is of Punaluu Beach. It is located off of Highway 11 near the southern tip of Hawaii. This beach is approximately 60 miles from Hilo and Kona. So, this beach makes for a great place to stop and stretch your legs and take in some stunning scenery as you travel from Kona side to Hilo side along the southern part of the island. Sea turtles frequent here, so keep an eye out for them, but do not approach them. Swimming at Punaluu Beach can be a bit cold since there is an underwater spring. The Big Island has other black sand beaches. You can find one near Puna called Kehena Beach off of Highway 137. The beautiful Waipio Valley along the north shore has a black sand beach. The closest black sand beach near Kona is Makolea Beach, but it is more difficult to see since you will need to hike a bit of drive a 4WD to it. I’ve not seen it in person, but I’ve seen photos and it isn’t as beautiful as the others on the island. I hope you will find a beautiful black sand beach in Hawaii. When you do, please resist the urge to collect sand as a souvenir. Legend is that it is bad luck to take any. Plus, these black sand beaches are rare, so please don’t endanger them by stealing the sand. I remember going to a black sand beach on the Big Island when I was younger but I don’t remember the name of it. I’ll ask my Dad. Hi Kailani – There was one famous one that was covered by a lava flow about 15 years ago. I think it was called Kamoamoa Black Sand Beach. Could it have been that one? Waipio Valley is awesome, steeped in legend and myth and beauty. You can hike down the road which is very steep, or drive down with a 4 wheel drive. DO NOT try to drive down in your rental car!